This brief presents the results of a survey conducted as part of the WBC-INCO.NET project initiative to support innovation capacities in the Western Balkans region. The WBC-INCO.NET project seeks to promote the bi-regional dialogue on science and technology between the EC, the member states and the Western Balkan countries. The survey aimed to pinpoint both present and likely future research and market needs as well as identify possibilities for collaboration in the region. This brief presents the results of a survey conducted as part of the WBC-INCO.NET project initiative to support innovation capacities in the Western Balkans region. WBC-INCO.NET partners from the Western Balkans include research and policy stakeholders from the following countries: Albania, Bosnia and Herzegovina, Croatia, FYRo Macedonia, Montenegro, Serbia and Kosovo (under UNSCR 1244). The survey aimed to pinpoint both present and likely future research and market needs as well as identify possibilities for collaboration in the region. The findings of the survey will support other activities that together will provide a clear overview of the region’s current situation and future needs in regard to innovation. These activities should help to prepare an action plan for further cooperation in innovation between the Western Balkan countries (WBC) and serve to establish closer cooperation between research and innovation stakeholders in the region (i.e. publicly funded researchers and innovative companies). This should include expertise from the industrial sectors and the fields of innovation management and market entry. It should also involve exploring EU programmes, other than FP7, and supporting programmes of other institutions that are directed toward increasing innovation in the WBC. Two questionnaires were jointly designed by the European Commission JRC-IPTS (Seville) and the Ivo Pilar Institute of Social Sciences (Croatia). The questionnaires addressed market and research stakeholders, including selected firms and entrepreneurial researchers, and aimed to identify current and future research and innovation needs in order to support the design of a joint action plan towards 2030.
i) Importance of different stakeholders in the innovation process. ii) Specific actions that can improve regional cooperation as well as innovation. iii) Factors necessary to stimulate regional cooperation divided in human resources, entrepreneurship infrastructure, expert assistance and cooperation between industry and research, fiscal and financial obstacles, and national and local regulations. iv) Likely outcomes of enhanced regional cooperation. The first questionnaire was submitted to selected firms in the WB region. Building on the results of the first questionnaire with the aim to compare them, a second questionnaire was sent to research stakeholders in the region. A statistical analysis was conducted for both questionnaires and the results were crosschecked. The results were circulated within the consortia for final refinements. It must be emphasised that the findings indicate only potential needs in the region, which need to be refined by further analysis and discussed with industry, research and regional stakeholders, for instance in a workshop for this purpose. The response rate of the industry questionnaire was low: only 20 firms replied, which nevertheless allowed the team to perform some analyses. The response rate of the researcher questionnaire was higher. The respondents were asked to assess the importance of 14 stakeholders for firms’ innovation capacities. Figure 1 (below) compares the proportion of researchers that ranked various factors influencing university-industry collaborations as highly important. A majority of the researchers assessed all the factors as more important in the future than today, which suggests that the researchers feel that other barriers need to be overcome in the short-term. The most important actions to improve cooperation between business and research in the region, both in the present and in the future are (1) more funding for knowledge/technology transfer activities and expert consultations and (2) more funding for collaborative research between universities and businesses. Whilst state and local regulations as well as expert assistance seem critical for innovative performance today, investment in human resources and infrastructure emerge as crucial to enhance cooperation in the future. The analysis of the questionnaire administered to both research and business stakeholders reflects disagreement as to which potential outcomes of enhanced regional innovation collaboration are to be considered more relevant. The only outcome that both equally perceive as important is access to new markets. This suggests the need to build both more awareness of new opportunities and (new) capabilities in the region. To this end, improved communication, including the respective infrastructure (e.g. ICT), and mobility seem to be critical. the progressive liberalisation and mutual opening of the service market within the WB region. The only action that business and researchers both perceive as important (ranking third for both of them) is developing regional initiatives for large infrastructural projects. Such an outcome highlights the need for enhanced communication and understanding between these two groups of stakeholders in order to achieve a joint agenda. new approaches and frameworks to enhance foreign direct investment and cross-regional investments in the region. A strong divergence between the views of industry and research in terms of present and future actions as well as areas for collaboration has emerged. This call for policy measures aims at improving communication between the two groups of stakeholders to facilitate the move towards a common agenda. Presently, a strong need is also felt for policies that provide more funding for knowledge/technology transfer activities and expert consultations as well as collaborative research between universities and businesses. This exercise is part of a wider project that aims at defining a long-term strategy for scientific collaboration within the Western Balkan countries and between them and Europe. The development of a common vision for the WBC: This vision should set the longer-term objective(s), which are to be defined by authoritative experts in the field and endorsed politically. The translation of the vision into a strategic research agenda (SRA), which entails specific, measurable, achievable, realistic and time-based (SMART) objectives. The strategic research agenda should make the vision operational and link the implementation of the vision’s objectives with existing competences in Europe (or in the region) and new ones to be developed. The implementation of the SRA: All participating public authorities should gear their programs and funding towards the implementation of the SRA in a coherent manner. The full toolbox of public research instruments should be explored and used to implement the individual joint programming initiatives. Regular monitoring and evaluation of progress against the SMART objectives should be ensured and the results reported to the political level. This climate policy research demonstrates that in India’s agriculture-dominated and gender-biased economy, the future of India’s adaptation strategy hinges on how well gender is integrated into agriculture-related policies and programmes. India’s National Action Plan on Climate Change, which lays out India’s strategy for mitigation and adaptation, recognises that women suffer more from climate change impacts than men. However, it fails to recognise that women are also integral to climate solutions. The research concludes with a set of policy recommendations for policy-makers and other actors. Why Should India Focus on Gender-Responsive Adaptation? There is growing scientific and anecdotal evidence in India that climate vagaries are affecting the life and work of its people, especially the 72% of its populations that lives off climate-sensitive agriculture and related activities. An overwhelming 60% of India’s agriculture is rain-fed and prone to recurring natural disasters like floods, droughts and cyclones which, according to climate scientists, will become more frequent, intense and unpredictable. These rain fed areas are also home to majority of the poor and marginalised farmers. India’s 11th Five-year Plan (2007-2012) notes the increasing ‘feminisation’ of Indian agriculture and a dominance of women workers in livestock rearing and collection of minor products from forests. Without an effective adaptation policy, India cannot achieve its Millennium Development Goals (MDGs) or its MDG-based National Development Goals as set out by the Indian Planning Commission. Climate change impacts often threaten to erode or inhibit development gains. Women are typically responsible for providing their household with climate-sensitive resources like water, food crops, fodder and firewood; they are also less likely to have the education, opportunities, authority and productive resources to adapt to climate change impacts. Without gender-specific disparities being addressed by adaptation policies, climate change will add another layer of gender inequality, especially in the farming sector. The fourth assessment report of the Inter-governmental Panel on Climate Change (IPCC) notes that gender differences affect the vulnerability and adaptive capacity of women and men. After decades of gender-blind climate negotiation texts under the UN Framework on Climate Change Convention (UNFCCC), women and gender concerns were mentioned in the December 2010 Conference of Parties (COP 16) Cancun text. The Himalayan eco-system in Himachal Pradesh (HP). The flood plains of Eastern Uttar Pradesh (UP). The Sunderbans coastal area in West Bengal (WB). The drought region of Andhra Pradesh (AP). Understanding some of the socio-economic impacts of climate change at the local level where gender-specific disparities are most intense. Identifying some of the gender-responsive policy gaps in the national adaptation missions and in specific state-level climate change plans, and suggesting possible corrections. Assessing how gender-responsive the work of grassroots NGOs working on adaptation is and how this can be up-scaled in a gender-responsive manner by the Central and State government’s climate-related policies and plans. Participatory collection of field-data by four grassroots NGOs, each in one of the above agro-climatic zones. There is little evidence to show the different impacts of climate change on men and women. The need to identify and study these differences is critical for making gender-responsive adaptation policies and programmes. This research gathered data from the four agro-climatic zones and used a gender lens to show how the same climate change impact affected women and men differently. The research revealed that men’s primary way to adapt was to migrate from farms which meant that women were left behind to both till the unproductive land and to continue their care roles. This put an additional burden on women because they had to till the unproductive land or labour in other fields, while continuing to shoulder their care-giver responsibilities with no support from the spouse. The table below captures this gender difference from the four zones. Longer waking hours to work in the field early morning and late evening to beat the heat (AP, HP, UP) Lesser tasks in the field. Higher indebtedness – women go to take loans and have the responsibility to pay off loans! Most NGOs this research study examined have similar approaches to integrating adaptation measures into farming practices. They build on traditional knowledge, adopt a diversified livelihoods basket, and add value through applied scientific and technological interventions. All this is done by first mobilising groups of farmers – both men and women but more women farmers. The reason for making women active players is because NGOs acknowledge that women farmers are more responsive than men farmers and achieve greater success. So women, more than men, are the main mobilizers of peer groups, recipients of knowledge and skills and risk-takers. Yet, these roles are hardly acknowledged by NGOs in documents, meetings and advocacy initiatives. Working with women also does not usually translate into women owning more productive assets or accessing more government schemes or participating more in government or community-level decision-making bodies. While women do reap some benefits and are also more empowered than earlier in some respects, many adaptive interventions put more time and labour burden on women as compared to men. The table below illustrates a few of the differential impacts of on-the-ground adaptation interventions on men and women and some of the policy gaps that need to be addressed. Incentives to promote joint farm land titles to spouses and leasing public land to women farmers groups. Availability of local weather-related information to women farmers. Revive traditional ponds and wells. Women need to be at the core of planning and implementation of adaptation interventions. This includes collection of gender-disaggregated data at all levels, gender-based monitoring and evaluation and gender-budgeting. The four-C framework given below sums up the main policy recommendations. Counting women in at planning, designing, implementing, resourcing and evaluating stages of all programmes and schemes. Currently, there is a huge deficit on gender-disaggregated data for policy making. Converging programmes and schemes at the planning and design stage through multi-sectoral and multi-ministerial bodies and at the implementation stage through local government agencies and local elected bodies. A specific need is to mandate gender-responsive ‘Local Action Plans on Adaptation,’ (or LAPAs) integrated with the Village Development Plans made by local elected bodies. Capacity building and empowering women and men at the level of local elected bodies, local government agencies, within scientific institutions working on adaptation and within relevant NGOs and community-based organizations. Gender-responsive decision-making institutions are basic building blocks for egalitarian adaptation policies. Collaborating with key stakeholders – adaptation science researchers, government agencies and departments, local elected bodies, user groups, civil society groups and legislators – to build resilience among the most vulnerable people through participatory innovation, utilization of traditional and local knowledge, adding value through scientific and technological interventions and converging all resources. Within this framework, the research identifies policy-level recommendations for specific actors – legislators, government planning bodies, government officers, local elected bodies, adaptation research scientists, civil society organizations and community-based groups. These policy recommendations form a blueprint of what India’s approach and policies must be in the coming decades to ensure that both men and women are able to reap the benefits of a climate-resilient path to development. Sponsors: Heinrich Böll Foundation, Germany and Christian Aid, U.K.
Download EPF Brief No. 243_Gender-transformative Climate Change Adaptation. Adger, W. N., et al. (2007). Assessment of adaptation practices, options, constraints and capacity. In Parry, M. L., et al. (Eds). Climate Change 2007: Impacts, Adaptation and Vulnerability. Contribution of Working Group II to the Fourth Assessment Report of the Intergovernmental Panel on Climate Change, Cambridge University Press, Cambridge, UK, 717-743. Agarwal, Bina. (1994). A Field of One’s Own: Gender and land rights in South Asia. Cambridge University Press, New York. ——- (2010). Gender and Green Governance: The political economy of women’s presence within and beyond community forestry. Oxford University Press, New Delhi. Dankelman, I. (2002). Climate Change: Learning from gender analysis and women’s experience of organising for sustainable development. Gender and Development 10(2), 21–29. Food and Agriculture Organization (FAO). (2003). Gender: Key to Sustainability and Food Security; Gender and Development Plan of Action (2002-07). Government of India. (2008). Eleventh Five Year Plan Vol I-III (2007-2012). Planning Commission. Oxford University Press, New Delhi. IWRAW Asia Pacific. (2009). Occasional Papers Series No. 14, Equity or Equality for Women? Understanding CEDAW’s Equality Principles, International Women’s Rights Action Watch Asia Pacific, Malaysia. Krishna, Sumi, ed. (2004). Livelihood and Gender: Equity in Community Resource Management. Centre for Women’s Development Studies. Sage Publications, New Delhi. 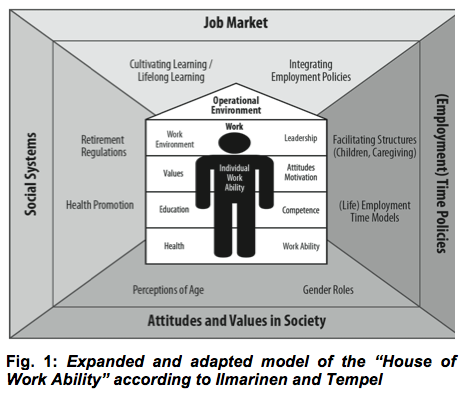 This was the first time that Taiwan conducted a large-scale expert opinion survey using the Delphi approach. The goal was to identify research topics relevant to shaping the future of agriculture in Taiwan. Applying roadmapping, the project presented policy suggestions at the end of 2011. The suggestions have been incorporated into the Taiwanese govern-ment’s Council of Agriculture (COA) research agenda as evidenced by COA’s call-for-projects announcement. Taiwan was one of the leading countries in subtropical agriculture several decades ago, but now agriculture has lost its importance in job creation, domestic production and international trade. However, agriculture is still at the root of the economy and has many functions beyond production – it provides the food we eat, conserves the environment we live in, and is a force for social stability. Taiwan, with nominal GDP $427 billion US dollars and GDP (PPP) per capita $35 thousand US dollars in 2010, is known for its manufacturing capabilities today, but it used to be exporting a lot of agricultural products and technologies to many countries long time ago. Since 1959, more than 100 agricultural missions have been dispatched to more than 60 countries, among which about half missions are currently at work in Africa, the Middle East, Latin America, and the Asia-Pacific. In fact, Taiwan’s total land area is about 36,000 square kilometers, most of which is mountainous or sloped. Therefore, agriculture is practiced mainly in the plains, which comprise 29 percent of the country. As a subtropical island characterized by high temperatures and heavy rainfall, Taiwan offers bio-diversities for agriculture, but also lends itself to the breeding of insects and disease. Particularly, there are frequently typhoons causing natural disasters in the summer and autumn every year. There have been significant changes in Taiwan’s agricultural exports over the years however. Years ago, Taiwan exported sugar cane, rice, and canned mushrooms or asparagus. Now Taiwan’s main exports are aquaculture products (e.g. tuna, eel, tilapia), leather and feathers, and its main agricultural imports include corn, soybeans, wine, tobacco, cotton, lumber, beef and wheat. In 1953, the average value of agricultural production increased 7.3 percent annually and exports increased at a rate of 9.3 percent, but beginning in 1970, agricultural exports fell behind agricultural imports. In 2010, imports were USD 12.8 billion and exports were USD 4 billion. The production value based on agriculture is estimated approximately 11.2 percent of GDP, while primary production accounts for only 1.5 percent of GDP in Taiwan. In order to revitalize the agriculture sector to meet the challenges of trade liberalization, globalization, the knowledge- based economy and particularly, climate change, the Taiwanese Government’s Council of Agriculture (COA) commissioned a project- Taiwan Agricultural Technology Foresight 2025 – to the Taiwan Institute of Economic Research (TIER). This four-year project (2008–2011), with an annual budget of USD 350 000, conducted foresight-related activities including demand surveys, trend and policy analyses, horizon scanning, visioning, essay contests, training workshops, two-round Delphi surveys, road mapping and development of policy suggestions (short-, mid- and long-term development plans and priorities) (see Figure 1). 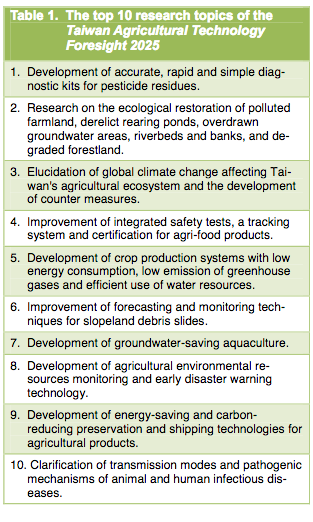 The project aimed to identify R&D priorities to meet the long-term objectives for agriculture in Taiwan such as to improve farmers’ productivity and livelihoods, to develop resource-efficient and environmentally-friendly ways to do farming, and to ensure food safety by instituting a traceability system, which were embedded in a vision of making a better living in Taiwan in terms of industrial development, environmental protection and life quality respectively. In 2008, TIER set up a task force with six researchers and two assistants to learn the foresight techniques, mainly from Japan. It built up a data-base of social needs, technological trends, research resources, critical issues and agricultural policies nationwide and worldwide. Under the support and approval of COA, the project set up the Planning Committee, including government officers, agricultural experts, senior research fellows, social scientists and an economist. 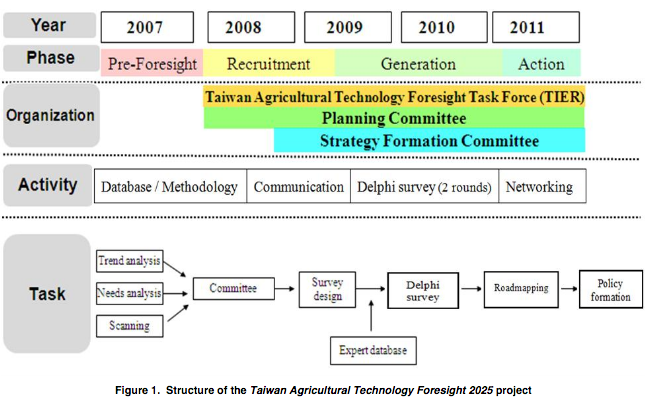 The Planning Committee decided that the project’s target year was 2025, and that the purpose of the foresight was to identify R&D priorities to meet the long-term objectives for agriculture in Taiwan such as to improve farmers’ productivity and livelihoods, to develop resource-efficient and environmentally-friendly ways to do farming, and to ensure food safety by instituting a traceability system, which were embedded in a vision of making a better living in Taiwan in terms of industrial development, environmental protection and life quality respectively. In order to link the foresight and policy, the project set up the Strategy Formation Committee, with ten subcommittees corresponding to the ten research areas of COA, each of which was comprised of agricultural experts and senior scientists. The members of the Strategy Formation Committee were nominated by the Planning Committee and then approved by COA. The duty of the Strategy Formation Committee was to depict 2025 visioning in each research area and to figure out the research topics to meet the needs for shaping the future agriculture in Taiwan identified by the Planning Committee. In 2009, the Strategy Formation Committee proposed more than 100 research topics for the project. The TIER task force tried to consolidate some of them and organize them in a uniform format. Then, the Planning Committee identified the final 74 research topics and the related key questions for the Delphi questionnaire. In 2010, the TIER task force built up an on-line survey platform and carried out two rounds of Delphi survey. There were 675 experts and scientists on the list of the first round, 546 of which participated in Delphi survey (response rate of 80 percent), and 512 of which questionnaire were effective. Then there were 546 experts and scientists on the list of the second round, 413 of which participated in Delphi survey (response rate of 76 percent), and 407 of which questionnaire were effective. Based on the survey responses to 74 research topics, the project compiled the indices of industrial development, environmental protection, life quality, national priority and government support respectively to measure the research topics in different aspects. The standard deviations of all indices at the second round became smaller than those at the first round, so it implies that the Delphi survey of the project did converge for reaching consensus. The survey shows that the government should support those research topics with higher ratings in environmental protection as well as in life quality particularly due to agricultural multi-function (externality). It is, however, slightly correlated between industrial development and government support to be needed for those research topics because some of them could be developed by the private sector. These research topics have been incorporated into COA’s research agenda as evidenced by COA’s R&D system call-for-projects announcement. 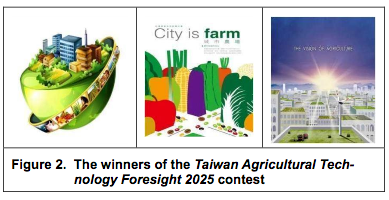 Besides, in order to attract the young generation to think about the future of agriculture, the project invited young people to participate in the Taiwan Agricultural Technology Foresight 2025 contest (see Figure 2). This was the first time that Taiwan conducted a large-scale expert opinion survey using the Delphi approach, in order to identify the research topics to meet the needs for shaping the future agriculture in Taiwan. The project made policy suggestions by road mapping at the end of 2011, and these have been incorporated into COA’s research agenda as evidenced by COA’s R&D system call-for-projects announcement. The major contribution of the project has been the government’s support for the research topics of ‘national priority’ in terms of industrial development, environmental protection and life quality, with equal weights embedded in the vision of making a better living in Taiwan. The project is expected to improve farmers’ productivity and livelihoods, particularly for smallholders; to develop resource-efficient and environmentally-friendly ways to do farming in Taiwan’s limited land area; to reinforce the links between production and consumption of agricultural products by implementing a traceability system. Download: EFP Brief No. 229_Taiwan Agricultural Technology Foresight 2025. The main purpose of the exercise is the development of new methods to discover patterns that new technologies follow and the opportunities they offer for innovation. This brief attempts to foster a new understanding of the mechanisms generating innovations. It presents a methodology to identify future technology opportunities based on text mining of scientific and technological databases. Assisting priority or agenda setting, the method could be useful for technology managers and corporate decision-makers in planning and allocating R&D resources. The analysis of new technologies has been of interest for many years. The increase in disruptive innovations and scientific research in recent years is driving institutions and also companies to develop methodologies for identifying technologies of the future. However, it is necessary to develop methods suitable for discovering the patterns according to which these technologies are likely to evolve. This will make it possible to convert them into opportunities for innovation as an essential prerequisite for maintaining competitiveness in the long-term. Scientific and specifically patents databases are generally regarded as precursors of future or ongoing technological developments. Therefore, the analysis of such databases should enable identifying certain technology gaps that potentially could be transformed into opportunities. Against this background, the project “How to anticipate opportunities around technologies” moves towards understanding the mechanisms generating innovations. This exercise was designed and launched in light of the need to foster and accelerate scientific and technological innovation. Scientific publications and patent records are analysed as the empirical basis of the study. Experts are then asked to comment on the results of the analysis. The methodology applied to monitor new technologies uses the tech-mining approach and a combination of quantitative analysis and expert knowledge. We will demonstrate how this instrument allows anticipating opportunities around technologies drawing on examples from two different industrial sectors. The methodology has been developed working with data from two different technological fields in order to compare and validate results. The two technology fields are waste recycling and “non-woven” textiles and their applications. The project is running from 2010 until the end of 2012. The application to the waste recycling sector is financed through the SAIOTEK programme of the Basque Ministry of Industry, Trade and Tourism. The exercise deals with the identification of opportunities based on scientific articles and patent information, using quantitative methods to process the information and expert knowledge for assessing it. The main goal is to identify the most important factors influencing the development of a new technology and to understand the mechanisms generating innovation. The project team is comprised of researchers from the Industrial Engineering and Management Departments of the two technical universities University of the Basque Country and The University of Valencia and the R&D centre TECNALIA. The collaborating R&D centre has been granted the right to make first use of this research. The exercise is divided into two phases. In Phase I, the technologies were defined in order to analyse the scientific knowledge in the respective technology field and outline the technology landscape using the knowledge contained in articles and patents databases. We applied the tech-mining approach in the first step, then used a cross-correlation matrix and finally performed principal component analyses (PCA). This resulted in visualisations of the technology sectors where it is possible to determine gaps around technologies. 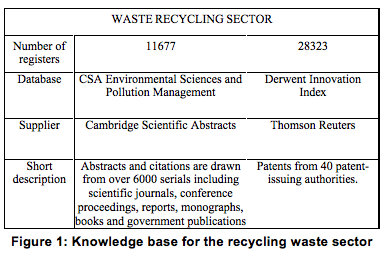 Figure 1 shows the characteristics of the scientific information analysed for the waste recycling sector. In Phase II, we will use qualitative techniques in order to assess the potential for the emerging technology gaps found. These interim results will be discussed with the experts (“bottom up”) to identify potential opportunities. The R&D centre will contribute upon request. They will play a key role particularly in identifying opportunities in the last phase. Previous works in this field were considered as well (see references). The foresight method developed in this analysis is innovative because it combines qualitative knowledge and quantitative data allowing the conclusions from the individual analysis to converge into a variety of industrial scenarios. Figure 2 shows an outline of the methodology. It retrieves and downloads the information on these two sectors using the Derwent Patents and Environmental Abstracts databases. The downloaded information is analysed using text mining techniques. In recent years, text mining has been an expanding area. The introduction of natural language techniques that use semantic algorithms combined with the most advanced statistical techniques, such as multivariate analysis or cluster analysis, have become powerful tools for discovering and visualising the knowledge contained in scientific literature. Phase I of the project has been completed; the major socio-economic trends have been identified and the results disseminated as a paper to the international community exemplifying the analysis for the waste recycling sector. At this point in the project, the main findings, for instance on new technologies in waste recycling, can already be utilised by innovative companies. One of the analyses was to determine the year in which the descriptor appeared for the first time (see Figure 3). The results allowed us to assess the new terms, such as “detritivores” or “allelopathy” in 2009, which belong to the biotechnological field. These terms, which we call weak signals, only appear once or twice. Biotechnological terms surfaced as we mined titles and terms in abstract in databases for 2010. These particular trends are also recognisable within the International Patent Classification IPCs for this period. We are working on creating multiple technological maps. For example, there have been several analyses of the patent applications downloaded from the Derwent database. Figure 3 shows a result obtained after the cross-correlation of the individuals (patents) in a two dimensional space according to similarity of the International Patent Classification limited to four digits, ergo according to their technological contents. IPC is used to assign them to a similar technology group. Then we used the maps to identify patent clusters and areas where patents are lacking. 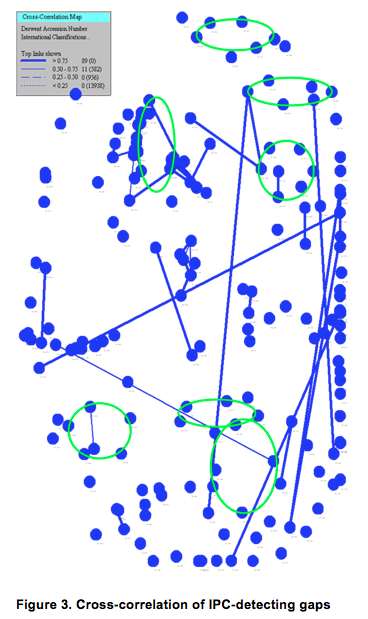 The green ellipses drawn in Figure 3 represent the gaps where there are no patents. In a further step, we screened and investigated the patents adjacent to each gap to determine the meaning of the patent gaps. The objective was to analyse the emergence of each gap and evaluate certain indicators that we expected to tell us whether the gap represents a technologically valuable area or not. Qualitative indicators were defined such that the density of the gap measures the average number of claim items of adjacent patents and the half-life of the patents in the vicinity of the gap while allowing to evaluate the documents on patents on the gap borders in terms of how they relate to the most up-to-date keywords. In order to establish a methodology to analyse the emerging technologies, we determined the year when the keywords, i.e. the descriptor, appeared for first time, as mentioned above. It is possible to classify these keywords into two types: keywords of emerging or declining frequency. By comparing, we can contrast the number of keywords by years between the different gaps. In essence, this procedure allowed us to measure emerging technologies through the keywords found in the patents surrounding the gap. In the field of non-wovens, the tech-mining methodology allowed us to identify several emerging technology trends, among others the increasing use of nanotechnologies in the patented inventions. During Phase II, we will validate the methodology. An advance in research requires the participation of experts in the field of waste recycling and non-woven textiles who can assess the articles in terms of newly found references. The opinion of the experts about the potential impact of newly identified technologies will allow us to determine the most innovative areas of work. The main contribution of this study to research policy is that it provides a methodology to identify new and emerging technologies leading to innovations. An institutional policy encouraging the tendencies identified should be able to increase regional competitiveness. Our analyses support decision-making through understanding how innovations are generated, enabling decision-makers to anticipate and address the challenges identified and the emerging weak signals. Furthermore, once the project is completed, we will have applied our method to two practical cases from the waste recycling and non-woven sectors. With these examples, we want to demonstrate how the methodology suggested can be applied to anticipate opportunities. The method could be particularly useful for technology managers and corporate decision-makers in order to plan and allocate R&D resources. Governments and regional development agencies could also use it to improve innovation policies in terms of planning and decision-making. However, in many cases, new technologies are a necessary but not a sufficient condition for successful innovations. A wide range of non-technical factors are relevant as well (demand, regulations etc.). For successful implementation, it will be necessary to identify the innovation pathways. We believe that in a context of increasing uncertainty and financial constraints, these results show that foresight methodologies such as tech-mining offer a positive return on investment for policy and decision-makers. Cozzens, S.; Gatchair, S.; Kang, J.; Kim, K.; Lee, H.J. ; Ordoñez, G.; Porter, A. (2010): Emerging Technologies: quantitative identification and measurement. Technology Analysis & Strategic Management 22 (3): 361-376. Belver, R.; Carrasco, E. (2007) Tools for strategic business decisions: Technology maps. The 4th International Scientific Conference “Business and Management.Vilnius, Lithuania 5-6 October. Selected Papers. Vilnius Gediminas Technical University Publishing House “Technika”, 2007, 299-303. Huang, L.; Porter, A.; Guo, Y. (2009): Exploring a Systematic Technology Forecasting Approach for New & Emerging Sciences & Technologies: A Case Study of Nano-enhanced Biosensors, in Proceedings of the Atlanta Conference on Science and Innovation Policy. Georgia Tech University, Atlanta, USA, 2–3 October. Rio, R.; Larrañaga, J.; Elizagarate, F. (2008): Patentalava. Dynamics of Innovation Strategies and their Relationship with the Evolution of Patents. The Alava province case, in The 5th International Scientific Conference “Business and Management”. Vilnius, Lithuania, 5–6 October. Selected papers. Vilnius: Technika, 475–480. The purpose of the SEA-EU-NET foresight process is to open up and structure the discussion on the potential future cooperation(s) between the EU and Southeast Asia in the field of S&T. We assess potential “futures” of organising S&T relations between the EU and Southeast Asia in 2020 and discuss their current implications and geopolitical consequences. The SEA-EU-NET project started in 2008 with the mandate to facilitate the bi-regional EU-ASEAN science and technology dialogue and to expand scientific collaboration between Europe and Southeast Asia in a more strategic and coherent way. Among many other things, SEA-EU-NET participated in the official EC-ASEAN COST (Committee on Science and Technology) meetings in Manila and Bali and presented project outcomes and recommendations. Complementary to the official EC-ASEAN dialogue, the SEA-EU-NET project organised stakeholder conferences in 2008 in Paris/France, 2009 in Bogor/Indonesia and 2010 in Budapest/Hungary, which served as platforms to discuss opportunities and pitfalls for stronger S&T collaboration between the two regions. The next stakeholder conference is scheduled to take place in Hanoi/Vietnam in November 2011. These meetings involved a large group of policy makers, scientists and science administrators. The close links between the official EC-ASEAN dialogue and the SEA-EU-NET project stakeholder dialogue has led to an enhanced level of S&T cooperation between the two regions. The SEA-EU-NET foresight exercise was launched during the Bogor/Indonesia 2nd SEA-EU-NET Stakeholder Conference in 2009 and has been designed to fit into and support these interlinked policy dialogues aimed at further increasing S&T cooperation levels. With this foresight exercise, the project aims at supporting the building of and commitment to shared visions of the future of S&T cooperation. Given the current stage of science and technology cooperation between ASEAN and EU, the process was mostly expert-driven. Regarding a specific and very central stakeholder group, however, it was participatory: All scientists with recent cooperation experience (ASEAN-EU co-publications since 2005 have been used as a proxy for cooperation) have been invited to participate. The format of “International Cooperation Foresight” (ICF) should be discussed separately from national technology foresight activities. Theoretical and methodological backgrounds have been provided by the work of the members of the former Policy Research in Engineering, Science and Technology Institute (PREST) and current Manchester Institute of Innovation Research as well as by the UNIDO Foresight Manual. Our experience with the exercise has shown that ICF needs to take into account a large number of “soft” drivers of future scenarios and related forecasts, basically all of which can be influenced to some extent by one of the two major stakeholder groups (S&T and other policy makers; scientists). For instance, ICF needs to take into consideration the financial resources available for cooperation (a driver directly influenced by S&T policy making) and trust among the research communities of the cooperating countries/regions (a driver reflecting the scientists’ attitudes). Thus, for international S&T cooperation foresight involving high-level policy making and research communities, most parts of the external context are in fact contingent variables internal to the process. Parts of what might be external variables in a technology foresight for an enterprise (e.g., the existence of certain policies or regulatory obstacles or the availability of natural resources) are internal variables for the ICF process (policies and regulations can be shaped by the policy-making stakeholders; decisions can be made to protect natural resources or make them available; etc.). This fact has to be taken into account when designing the foresight methodology. These considerations also partly motivated our decision to look at a ten year perspective, i.e. the 2020 future of S&T Cooperation between ASEAN and the EU. While the horizon of the Europe 2020 strategy also played a role, we have looked for a time horizon that can be considered without having to take into account possible major system changes, which would again add complexity. This foresight exercise applied a combination of (singular success) scenario building, Delphi surveys and backcasting. Concretely, the stakeholder discussions regarding the 2020 future S&T cooperation were kicked off in a success scenario oriented driver identification workshop. High-level policy makers from Southeast Asia and Europe were asked to identify ‘drivers’ and ‘shapers’ of a future basic success scenario of bi-regional S&T cooperation based on drivers presented in the literature and to comment on and rate the relevance of the various drivers identified. We discriminated the regional focus of the answers: participants could rate the perceived relevance for either Southeast Asia or Europe. Given the interactive atmosphere in the workshop, this combining of scenario building with backcasting elements proved to be a successful strategy. We continued the driver identification with the second major stakeholder group, namely the scientists, selecting those who had recent ASEAN-EU co-publication experience. With the help of an open e-mail consultation asking respondents for the factors that they believe might influence what future S&T cooperation between the two regions might look like, the individual responses of about 1,200 scientists were collected, analysed and synthesised into a set of around 40 drivers. The drivers then were validated in a two-stage Delphi survey, presented as directional variables (pointing towards increasing cooperation)and formulated as concrete recommendations in the original wording of the scientists (which we correctly believed would make it easier for their peers to follow their reasoning). We distinguished between answers given from a Southeast Asian perspective and a European perspective (irrespective of the current region of residence). In the second Delphi round, approximately 560 scientists checked the average relevance ratings given in the first round, further commented on them and partially corrected their previous answers. This led to a series of concrete recommendations for instruments to enhance S&T cooperation and was followed by thorough desk research to identify interdependencies among the most relevant drivers. The results up to this point have been published and made available to the European Commission, the policy and scientific community as well as the wider public as a SEA-EU-NET report (www.sea-eu.net/object/doc­ument/2469.html. The next step was to feed the results back to the target groups, especially the policy makers in both regions. While there were no project resources for an additional workshop with European policy makers, we were able to arrange a half-day session during a major SEA-EU-NET event in Chiang Mai/Thailand in May 2011 that attracted around 20 policy makers from 8 of the 10 ASEAN member countries, which we consider a big success. Rather than generating additional output, the goal of the workshop was to feed back the evidence produced by the SEA-EU-NET foresight and to further inspire a joint process of creating common visions of the future. Two relevant preparatory steps realised by the foresight team were (1) a more refined 2020 success scenario of ASEAN-EU S&T cooperation that presented a desirable future in the form of a newspaper article narrative (looking back from 2020 towards 2011 outlining what has gone well in this decade) and (2) linking the SEA-EU-NET cooperation foresight with relevant regional foresight processes, namely the future ‘paradigm shifts’ identified in the ‘Krabi Initiative’ on the future of science and technology in ASEAN. The link between both foresight processes was achieved by proposing the following two questions to the participants: How can future ASEAN-EU S&T cooperation support the Krabi Initiative paradigm shifts, and what would succession of S&T cooperation mean in this context? These overriding questions were discussed in five knowledge café panels (one for each of the five paradigm shifts in the Krabi initiative). The outcome of the discussions is currently being used by the SEA-EU-NET foresight team to refine the draft success scenario. In a final step, the foresight report mentioned above will be amended and will form a central chapter in an upcoming SEA-EU-NET book publication to be presented to the S&T cooperation policy making and scientific community, inter alia at the next SEA-EU-NET Stakeholder Conference in November 2011 in Hanoi/Vietnam. One indicator to assess the success of the exercise is the number of stakeholder participants in the process. In terms of the members of the scientific community who we were able to engage in the process, it clearly was a success: 280 qualitative answers were collected during the open e-mail consultation. Around 1,200 scientists participated in the first Delphi survey round. This corresponds to approximately 12-14% of the invitees. About 560 scientists participated throughout the whole process and also finished the second Delphi survey round. Regarding the participation of policy makers, we faced two limitations: our resources for conducting a face-to-face drivers workshop but also the limited pool of policy makers knowledgeable in EU-SEA S&T relations. We consider it a success that 16 participants (7 Southeast Asian and 9 European) policy and programme makers actively participated in the first driver assessment scenario workshop in November 2009 and around 20 Southeast Asian policy makers in the second success scenario workshop in May 2011. Regarding the impact on the policy of the European Commission, as the client of the exercise, it is too early for a final assessment. We have submitted the foresight report to our project officer in February 2011. Apart from the internal discussions that might be triggered by the report (but are not visible to us), we will look for open dialogue with the EC, for instance during the upcoming SEA-EU-NET events, the most prominent one being the next SEA-EU-NET Stakeholder Conference in Hanoi/Vietnam in November 2011 where EC representatives will also participate. The impact on policy cannot be evaluated yet. First results of the foresight exercise, most notably the results of the scientist consultations, have been presented to a wide audience of policy and programme makers and researchers during the SEA-EU-NET stakeholder conference in Budapest/Hungary in November 2010. The foresight report has been shared with the around 1,200 participants from science in the process. Methodological reflections based on this exercise have been published in the Russian Journal “Foresight” of the Moscow Higher School of Economics. Depending on future project resources, the process can be continued in the future. Recommendations coming out of this international S&T cooperation foresight study can be found below. The recommendations have been formulated very recently. It is too early to discuss possible realisations of the recommendations. This foresight exercise has the mandate and has been designed accordingly to produce policy recommendations. They can be found in an abbreviated form below. As this foresight exercise aimed at structuring and stimulating policy dialogue on future S&T cooperation between Southeast Asia and Europe, the recommendations feed into this dialogue. While it is too early to evaluate the outcome of the exercise, it will hardly be feasible to link the possible implementation in the future of measures growing out of these recommendations to the influence of the foresight process, even more so as the recommendations emanate (bottom-up) from the stakeholder communities engaged in the policy dialogue or the related scientific practice. Another outcome might be a closer consultation practice between bi-regional S&T policy making and the scientists actually engaged in cooperation. Among possible, unintended results might be a situation where S&T policy makers recognise, in the follow-up of these discussions, that the future of S&T collaboration lies in a bilateral rather than a bi-regional setting. We believe that the foresight exercise has benefited the participants in that it has helped them in structuring their own and their peers’ thinking about the future of S&T cooperation between Europe and Southeast Asia. This can prove relevant to policy makers when they design future policies and to scientists when they think about engaging in international cooperation. We will collect feedback on the exercise among the two major stakeholder groups, i.e. the policy makers and the scientists. With regard to the scientists, we have shared the foresight report with them recently (April 2011) and informed them about our steps for disseminating the results. Further discuss the report among the stakeholders involved in the process of policy development. Keep scientists engaged in the dialogue on and planning of S&T cooperation. Foster coherence between STI policy and other policy areas. Consider internal diversity of both regions and their needs. The most important motivations for scientists to cooperate are a) the goal of applying state-of-the-art science to a topic of mutual interest and relevance, b) the feeling of contributing to the development of a country and c) to solving global challenges, d) gaining access to a field, expertise and equipment, and finally, e) friendship and f) reputation. S&T cooperation should be sustained on a long-term basis. Find a balance between a) flexibly defined bottom-up approaches and the dedicated funding of S&T cooperation with a thematic focus and b) supporting cooperation in basic and applied research. Personal contacts are more relevant than institutional agreements. Therefore, supporting mobility and networking is crucial. Enhance equilibrated mobility in both directions, from Europe to Southeast Asia and vice versa. Existing human and network resources should be harnessed creatively. Established scientific conferences could convene in Southeast Asia; retired scientists could be offered part-time positions; senior scientists could engage in cooperation and exchange within sabbatical schemes. PhD student exchange should be supported to a higher degree. Southeast Asian diaspora academics in Europe as possible facilitators of S&T cooperation. Return and reintegration support schemes. Reward schemes for successful cooperation. Quality metrics for assessing the success of international S&T cooperation projects. Regional training networks, joint research centres and other joint research infrastructure. Bridging institutions offering administrative, research management and partnering support. Simplification of administrative burdens like visa issues, material exchange and field access clearance procedures. Open access to literature and sample databases. Regional availability of joint research results. Degelsegger, Alexander & Gruber, Florian (2011): Scientific cooperation between Southeast Asia and Europe in 2020. Driving factors as assessed by scientists and policy-makers, SEA-EU-NET Deliverable 4.2 to the European Commission, online at http://www.sea-eu.net/object/document/2469.html, last accessed: 24 July 2011. 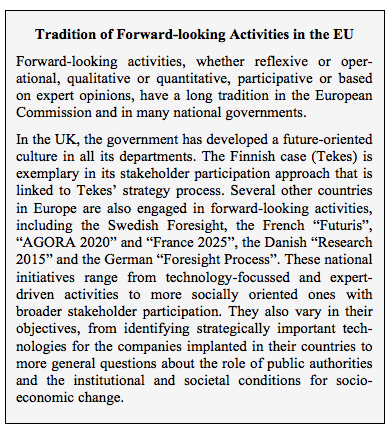 Gruber, Florian & Degelsegger, Alexander (2010): S&T Cooperation Foresight Europe – Southeast Asia, in: Форсайт (Foresight), 4(3), 56-68.
ipts/Joint Research Centre of the European Commission (2007): Online Foresight Guide. 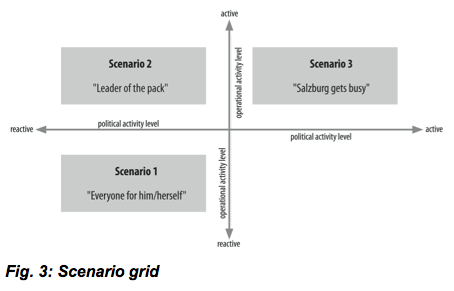 Scenario Building, online at: http://forlearn.jrc.ec.europa.eu/guide/3_scoping/meth_scenario.htm; last accessed: 24 July 2011. Miles, Ian (2005): Scenario Planning, in: UNIDO Technology Foresight Manual. Volume 1 – Organization and Methods, 168-193. Popper, Rafael (2008): Foresight Methodology, in: Georghiou et al. (eds. ): The Handbook of Technology Foresight. Concepts and Practice, Cheltenham: Edward Elgar. Schoemaker, Paul J.H. (1995): Scenario Planning: A Tool for Strategic Thinking, in: Sloan Management Review, 36(2). Slocum, Nikki (2003): Participatory Methods Toolkit. A Practitioner’s Manual, Brussels: viWTA/UNU-CRIS/King Baudouin Foundation, p. 75. Technopolis Group et al. (2008): Drivers of International Collaboration in Research. Background Report 4, online at: http://ec.europa.eu/research/iscp/pdf/drivers_sti_annex_4.pdf, last access: 24 July 2011. This brief presents the findings of a research project aimed at understanding the influence of policy-oriented foresight on public policy in Flanders. A foresight identifying six strategic clusters for technology and innovation policy in Flanders is analysed. The results of this analysis show that the foresight-oriented technology assessment (FTA) did have a significant impact on the policy process, but the greater effect might prove to be in its role as a reference point for future FTAs, which will then give shape to long-term technology and innovation policy in Flanders. 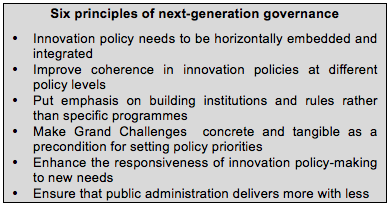 Policy-oriented foresight or foresight in a public policy context is aimed at supporting the decision-making process. By anticipating as much as possible different, alternative developments, it seeks to contribute to effective long-term decision-making. The policy process itself, however, is non-linear and often depends on temporary “policy windows” (Kingdon, 1995), which leave the specific role of exercises aimed at strengthening the evidence base of public action a little unclear. This is also the case for policy-oriented foresight. The literature on foresight contains many studies that identify factors for success. However, little empirical evidence is available that policy actors actually use the outputs of foresight exercises aimed at supporting policy decisions. Based on the factors for success found in the foresight literature, our research project analysed three case studies. The first case examined was a foresight identifying six strategic clusters for technology and innovation policy in Flanders. This brief assesses whether and how the foresight influenced the Flemish government’s policy decisions. The analysis of influence was informed by the evaluation literature since studies on foresight rarely address this question. The first section of this brief provides insight into different aspects of the foresight research in this particular case. The assessment of the influence of the foresight in the second section is followed by a first set of recommendations on how to improve the relationship between policy-oriented foresight and public policy. The Flemish Council for Science and Innovation (VRWI) conducted a foresight on innovation and technology in Flanders from 2005 to 2006. The VRWI is a strategic advisory council in the policy domain of science and innovation. It advises the Flemish government on its science and technology policies either in a proactive manner or at the government’s request. The council is a multi-actor arena where different stakeholders in the field of science and innovation meet. These stakeholders mostly have an industrial background, but they also include scientists from universities or representatives from other knowledge institutions in Flanders as well as government representatives from the administrative or political level. The VRWI operates as a ‘boundary organization’ (Guston, 2001) between science, politics and society; this will prove important for the influence of the foresight exercise that the organisation conducted on public policy in Flanders. The foresight was set up in 2005 at the VRWI’s own initiative. It aimed at “providing a long-term reference point for technology and innovation in Flanders” (Smits et al. 2006:10). The starting point for the study can be traced back as far as 1997 when the VRWI and other key stakeholders in the technology and innovation field felt the need to gain more insight into the scientific, economic and societal developments that might possibly influence the welfare and well-being of the citizenry in Flanders. Together with a group of university researchers, a process was organised to develop an appropriate methodology that would serve to assess this problem. Methodological inspiration was found in foresights from Japan and Germany as well as those conducted at the European level. Initially, the foresight had been designed as a rather broad exercise, addressing different societal, economic and scientific problems. However, this broad focus was not retained. The VRWI had initiated the foresight proactively, but upon further consultation with stakeholders, among them political actors, the scope of the study was narrowed down to focus on technology and innovation. Central to the analysis were those developments in the science, technology and innovation field necessary for Flanders to remain competitive both within the European area and the globalised world. Once the focus on technology and innovation had been established, the different steps to conduct the foresight were put in practice. The VRWI took the lead while cooperating closely with the scientific research group that had developed the methodological approach. The foresight was conducted in three consecutive steps, leading to the formulation of specific policy priorities for six sectors (or clusters) of technology and innovation in Flanders. The third step was the actual foresight. There, the future was assessed with a medium-term horizon of about ten years, i.e. 2015. As will be elaborated below, the study was highly participative and intensive. In a first phase, a SWOT analysis (strengths, weaknesses, opportunities and threats) was conducted on the different sectors in the technology and innovation field in Flanders. The first two phases took about a year to be completed. The selective expert consultation at the end of phase two set the stage for a broader consultation of experts via the Delphi method in the third phase. This final phase was framed in terms of the six strategic clusters identified. The actors consulted were all R&D experts in the field of technology and innovation in Flanders. In total, 130 R&D experts participated in the third phase of the study, which took six months to be completed. The experts were divided along the six strategic clusters identified and, using the Delphi method, were asked to assess 160 possible future developments as well as the current and future capacities in the field in Flanders. Via two or more rounds of discussion, a consensus was reached between the experts in each of the strategic clusters. 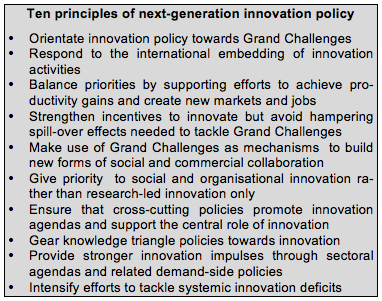 They identified 30 specific priorities in technology and innovation. Additionally, 85 of the 130 experts agreed to evaluate factors critical for the achievement of these priorities. The VRWI Council then validated these results and formulated specific recommendations for the different stakeholders: universities, industry and government. These recommendations were of particular importance to the latter. A more detailed account on the role of government within a broader technology and innovation context and the use of the results of the study is provided in the next section. The foresight was captured in two reports. Firstly, a summary report introduces the 30 priorities, the factors for success and the set of recommendations. Secondly, a more technical report elaborates upon the foresight process itself. It provides a detailed account of the three phases that constitute the foresight. Additionally, the Council and its president took specific action to promote the results of the study among a broad range of actors. They did this by presentations and road shows to diffuse the results. An important step in this respect was to engage the support of universities and industry not only before and during the foresight process but also after the foresight was completed. This assured diffusion of the results among a first and important set of stakeholders. A third important stakeholder, government, was much less intensely involved in the foresight. Diffusion of the results of the study among political and administrative actors is, however, an important factor for the foresight to have an impact on technology and innovation in Flanders. The next section assesses to what extent this was accomplished. Did the foresight influence the Flemish government’s strategic decision-making on technology and innovation? To answer this question, we must first consider the concept of influence itself. Moreover, we must describe the broader technology and innovation policy context in Flanders before we can adequately address the question of influence on policy there. These are the issues we will now turn to. From the perspective of policy actors, influence of evidence on policy can be viewed as knowledge utilisation. There are three dimensions for the analysis of influence on policy: source, intention and moment. This brief focuses in particular on the first dimension of influence: the source of influence. Direct instrumental influence is reflected in official policy documents. Conceptual influence is seen as “enlightenment” (Weiss, 1980) of policy makers. Agenda-setting influence means that new topics can be discerned, which were previously not under the attention of policy makers. Political-strategic influence takes place when political actors legitimise or oppose government actions based on the study’s results. The foresight can also have a significant process-related influence on policy and policy actors. The involvement of political or administrative actors at an early stage of the process might promote a more future-oriented view on policy or a better understanding of the possible added value of foresight for policy. Indirectly, this process-related influence might enhance the product-related use of foresight since it makes policy actors more receptive to its outcomes. From a historical perspective, technology and innovation policy in Flanders can be characterised as predominantly technology-pushed or supply-driven. Policy ‘demand’ was and is to a large extent adapted to industrial and scientific ‘supply’. 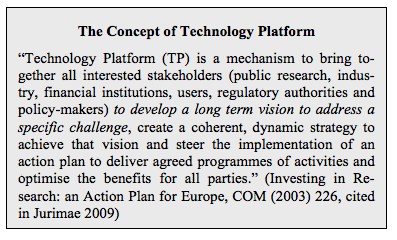 In other words, technology and innovation policy in Flanders is usually developed bottom up. 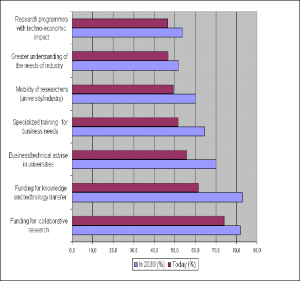 Public funding is mostly responsive to the R&D policy of industrial actors and of universities. It is to a much lesser extent coordinated (let alone steered) by government within a broader strategic framework. The foresight tried to provide such a strategic framework by identifying future technology and innovation priorities. Via its recommendations, it also assigned a specific role to the Flemish government for the framework to be implemented. In principle, the Flemish government could assume different roles, ranging from a hands-off and encouraging position (bottom-up policy approach) to a hands-on and actively steering role (top down). The latter is in order when the task at hand requires making strategic policy choices and taking the necessary actions to enable them. Assuming that the foresight served as necessary input for establishing a strategic framework on technology and innovation in Flanders, the involvement of a broad range of stakeholders was not only a logical consequence in a supply-driven policy domain. More importantly, it secured the necessary stakeholder support for implementing the priorities–which is especially critical when the strategic priorities are defined by a hands-on, steering government. The influence of the foresight on public policy was analysed through a thorough document analysis and interviews. The document analysis included strategic policy documents, policy briefs, white papers, parliamentary documents etc. The interviews were carried out with political and administrative stakeholders as well as members of the VRWI responsible for the study. At first, the report had no influence on public policy. The foresight report was published in 2007, at the end of the then Flemish government’s legislative period when policy directions had already been decided upon. The policies in place were further enacted toward the end of the legislature. Later on, however, the results of the foresight eventually significantly influenced public policy in Flanders in several ways. First, there is reference to its results in official strategic policy documents, such as the broader strategic framework project “Flanders in Action” set up by the Flemish government to make Flanders a frontrunner region in the social as well as in the economic domain. 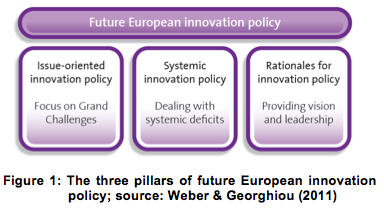 This emphasis on the strategic level was translated into the Flemish government’s policy note 2009-2014 on innovation policy and the related policy briefs and actions. More recently, in May 2011, the Flemish government approved a conceptual brief giving shape to a more hands-on strategic approach in technology and innovation in Flanders. The focus on a ‘challenge-driven innovation’ approach is particularly inspired by the strategic orientation provided in the foresight. Moreover, the establishment of innovation nodes can be traced back, among others, to the strategic clusters defined by the foresight in 2007. It therefore seems fair to say that the foresight has had an important direct instrumental influence on public policy in Flanders. The study is also well known among a broad range of actors in the policy domain. Especially the first two phases of the study (SWOT and relative positioning of Flanders in Europe) have served as a knowledge base for political and administrative actors in government, marking an important conceptual influence of the foresight. When we consider the study’s influence on the political agenda, political attention seems to have been mostly directed toward the perceived need to make strategic choices for the domain. This need was addressed in the foresight and played a key role in conducting the exercise. Contrary to a predominantly hands-off approach in the past, the government now has come to consider, accept and implement a more demand-driven approach when deciding on innovation policy at the strategic level. Thus, we can discern an important, directly instrumental and conceptual influence on policy in terms of agenda-setting. This is a medium-term influence, i.e. the effects are observed three to five years after the study was published. By contrast, there does not seem to have been any politically strategic influence. Additionally, the foresight has also had an important process-related influence. It is considered an important first exercise of its kind in the policy domain since it was aimed, quite explicitly, at bringing about a strategic, long-term vision and making policy choices in technology and innovation in Flanders. It has introduced a certain dynamic among the actors in the policy domain itself. Several actors indicate, for example, that a follow-up foresight is necessary to develop an adequate long-term strategic policy in the domain of technology and innovation since this foresight dates from 2006 with a horizon of 2015. Guston, D. (2000): Between politics and science: assuring the integrity and productivity of research. Cambridge University Press, Cambridge. Kingdon, J.W. (1995): Agendas, Alternatives and Public Policies. Second edition, Boston: Little, Brown and Company. Smits, E., Ratinckx, E. & Thoen, V. (2006): Technology and innovation in Flanders: priorities. Brussels: Flemish Council for Science and Innovation. Weiss, C. (1980): Knowledge creep and decision accretion. Knowledge: Creation, Diffusion, Utilization 1(3), pp.381-404. In the project “Roadmap 2020”, funded by the German Federal Ministry of Education and Research, seven fields of environmental policy were investigated in order to explore to which extent research and development activities will be able to foster future environmental innovations. The purpose of the project was the identification of strategic options for research and development and their transfer into practice in the field of environmental technologies by 2020. The results were gained by literature and Internet research, an expert opinion survey and four workshops on different topics.